MPG-o-Matic Honda Fit Sport Summary: While it’s a good bit pricier then the Chevy Aveo, Nissan Versa, and Toyota Yaris, the Fit Sport trumps the competition with a sporting card, a versatile interior, distinctive styling, and excellent gas mileage. The 2009 Honda Fit is available in two levels of trim, the base Fit and the Fit Sport. All 2009 Fits are equipped with a 1.5 liter i-VTEC 4-cylinder engine, mated to a five-speed manual or automatic transmission. The Fit’s inline four produces 117 horsepower (HP) and 106 foot pounds of torque. We absolutely demolished the official estimates for our five-speed automatic 2009 Honda Fit Sport review unit, scoring an average of 44 MPG on the Interstate highway, with 34.3 MPG combined. Test period temperatures ranged from the thirties through the forties, with freeway speeds between 60 and 72 miles per hour (MPH). While the Fit is fun to push through the twisty bits, both in town and out in the country, there’s no mistaking it for a rocket ship. With just 117 HP to work with, off-the-line acceleration is a bit leisurely. When turning, you can lose track of which paddle is which … until you feel the back of the paddles. The upshift (right) paddle has two vertical ridges that put you on track in an instant. The Fit provides both average fuel economy and real-time MPG gauges in a LCD display just under the speedometer. This little critter responds exceptionally well to light-footed driving, but it takes some finesse. We saw distinct differences in fuel economy between driving with the cruise control on and off at highway speeds. The trick to getting the best fuel economy from the Fit? Use Sport mode, upshift early, watch the real-time MPG gauge, and drive conscientiously with a light foot. Our philosophy and methodology at MPGomatic is simple. 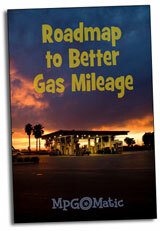 Getting the best mileage is all about knowing when to let off the gas. The greater the distance you drive with your foot completely off the accelerator pedal, the higher your MPGs. The Fit is a driver’s car of a different sort. From the steering wheel controls through the flexible interior, versatility and thoughtful design are the emphasis. The Fit Sport features an USB audio interface in the upper glovebox. The optional satellite-linked navigation system conveniently displays all the files on your USB digital music device, sorted by playlist, album, artist, and track. You can navigate via the navigation system’s touch screen or through the steering wheel controls. While the navigation system includes voice control, there is no voice control over USB audio. The rear seat and cargo area are best in class. The Fit’s “Magic” back seat doesn’t just fold down, it folds completely flat … and it folds up, to boot. This allows the cargo area to accommodate the widest range of objects, with a remarkable 57.3 cubic feet of space. The Fit is a wonderful little car but it’s not free of shortcomings. While there’s an overabundance of (10!) cupholders in the Fit, there’s only one 12-volt outlet and hands-free Bluetooth is not available. The 2010 Fit needs to offer Bluetooth and additional power outlets. All-in-all, we found the Honda Fit Sport to be quite roomy and fun-to-drive, which can be a rare characteristic in a small car with such remarkable fuel economy. While the Fit’s not nearly as sporting as a MINI Cooper, it’s considerably less expensive, with a far more roomy and versatile interior. I have a 2009 Fit and you can’t trust the auto MPG calculator on the dashboard. In reality it seems to be about 4 MPG too high depending on how you drive it. Please, in the future, post MPG estimates based on actual calculations from the odometer. @Dave – I relied on the Fit’s Average MPG gauge for the highway mileage, not the real-time gauge. Combined mileage is determined by tank fills. I have the same Blue Sensation pearl 2009 Fit shown in the video but w/o the Nav & VSA. Its a great little car, has a lot of space on the inside, i love the USB input- i play my songs from a regular 8GB flash drive. The mpg i have obtained since purchase range from the lowest of 32mpg to 34.5mpg with about 60% highway/ 40% local. I am expecting better results once the weather warms up and the car is better broken into. The gauge is always off by 4-5mpg unfortunately, but i still use the gauge while driving to position my foot on the accelerator for best mpg. Overall, its a great little car for anyone thinking about purchasing one. I’m trying to figure out why the Auto 2009 Fit is getting better Hwy MPG than the manual? Is the auto geared taller at Hwy speeds over the 5 speed manual? If you cared about MPG you would learn to drive a manual transmission. @Glen – With the advent of CVTs and other technology, a growing number of modern automatic-equipped cars are rated higher than their manual transmission-equipped versions. @Asdf – That used to be the case. It isn’t any more. @Dave 42 MPG on the high way is one MPG less then the Honda Insight and three MPG less then the Civic Hybrid. Both of the hybrids cost a heck of a lot more and just what will be done with these “clean” batteries when they no longer hold a charge and people want to throw them out? This weekend I’ll be taking my Fit on it’s first road trip and I can’t wait to see how it does. honda will recalibrate the mpg gauge under warranty for cars with faulty gauges. they do not advertise this but will do it on request. my son had his fit recalibrated and the readings are much more accurate. Great review! I find it amazing the amount of energy people put into writing such negative responses. Even if the MPG is off by such a slight margin, there is no need to be so rude and classless. Dave, I appreciate your reviews as they have helped me gain more incite on my future car purchase. Please keep up the good work and know that there are a ton of people that enjoy your website. I buy this Honda 2009 Fit Sport with 28,410 miles on it; Honda Cert. I live in Miami. We are heavy on the A/C. I tell you man its a cream puff. OK man not one problem yet OK. Let me tell you something. It’s like a Jaguar man..you know. With the heat and A/C I get a good 31 to 32 MPGs. OK now I am in the city man you know. It’s hot here in Miami. It’s crazy I tell you. I have managed to get 33.5 as an average. Sixty % in the city and 40% highway OK. I tell you man its a cream puff. Back in March 2012. My cousin Alby came from Cuba. We drove to Disney. The weather was cool man. I got 38 MPGs. Driving 75 to 80 MPH. Now let me tell you something man. By the time I past Stuart Fla. The temperature changed. We went from 81f in Miami to 60f and once 50 miles from Kissimmee. The temperature was 55F. No kidding around man. Yes this state its crazy weather man. Cold fronts sometimes they just can’t make it to Miami. They stop and don’t pass Orlando Florida. They call it stall. My miles got even better when I took the A/C off. I now have put Eibach springs lowered 1.2 in the front & 1.4 in the back. You got to buy this car. My friend told me its now called a heavy weight. He tell me now new cars have more power with better gas mileage. I tell him but its not a Fit. I told him…it’s OK. My car they also call it the Jazz. That’s right a cream puff. You going to like this car man. You tell em MiamiJazz said so. OK later my friend.